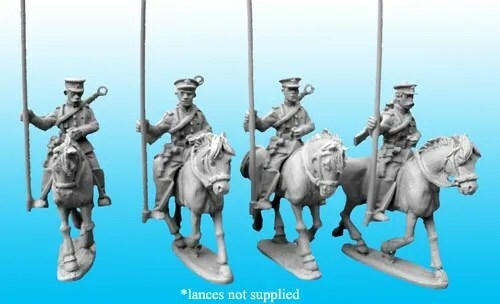 As hinted a few weeks back, Copplestone Castings have come out with some new White Russian Lancers (BU50). The models are based on the ilustration in the Osprey book: Chinese Warlord Armies 1911-30. So where do these guys come from ? They’re referred to in “Sand Against the Wind” by Barbara W Tuchman, in her biography of Joe’Vinegar’ Stilwell. After trying in vain to see Chang Tsung-chiang he prowled around the city. “Rusky Cavalry” the feared and prized adjunct of a northern warlord’s army galloped through the streets. They wore dark green, almost black uniforms with yellow leather boots reaching to their thighs, and carried an armoury of weapons: penannt tipped lances in their stirrup holsters, long barreled Mauser pistols in their wooden holsters, ands the da Bao or Chinese beheading sword, like an oversize machete, strapped over the shoulder in a canvas scabbard. So having worked out that I could cobble them together from other Copplestone pieces from different packs, and make some pieces myself/greenstuff, I asked if they’d do me a deal on the pieces. Instead he offered to make them. Ask and you shall get (eventually) !